What can I say, Obama is just like every other politician. He's full of it. After blasting President Bush and accusing him of "undermined the Constitution," President Obama now realizes that President Bush was correct in keeping the secrets around the Terrorist Surveillance program and is fighting the same lawsuit that President Bush fought. What does this prove? It proves that we cannot trust what candidates say in a campaign. 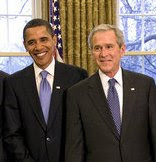 Obama did not have all the facts in the campaign yet he chose to blast Bush for things he now agrees with. He took cheap shots at Bush for political gain. Read the article for the particulars, but the bottom line is we need to stop electing people based on celebrity, and what they say in a campaign. We need to elect people who have a record of accomplishments. Most Senators don't have to run anything so they don't make good managers. We need to elect someone who has done something like run a state, or a military department, or a small or large business. Someone who knows what they are doing. Whether you are conservative or liberal, please vote for people based on a record of accomplishments and not celebrity or campaign rhetoric.